Eden as depicted in Bosch's The Garden of Earthly Delights includes many exotic African animals. Eden is described as a paradise where the first man and woman lived naked and not ashamed among animals and a great variety of fruit-bearing trees. They could freely eat the fruit of all the trees except one that God prohibited them from eating, called the Tree of Knowledge of Good and Evil. The Devil (in the Bible symbolized by a serpent) tempted them to eat of that forbidden fruit, and as a result humanity was expelled from the Garden of Eden, never to return. 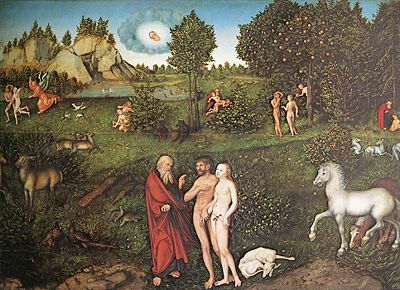 The Garden of Eden is recognized in the three Abrahamic religions of Judaism, Christianity, and Islam. Some other religions and cultures have a creation story containing a similar concept to the biblical Garden of Eden, ascribing various locations to the place of first habitation. The Garden of Eden story is recounted in Genesis 2-3. After God (Yahweh) created Adam from the "dust of the ground," he planted the Garden of Eden and placed Adam there. "Blessed are those who wash their robes, that they may have the right to the tree of life and that they may enter the city by the gates" (Revelation 22:14). As to the meaning of the forbidden fruit of the Tree of the Knowledge of Good and Evil, various suggestions have been put forth, including an apple, grapes, figs, wheat, a pomegranate, and a citron. The Bible gives no clue, and most commentators hold that the exact identity of the fruit is of secondary importance to the issue of obedience. That is, the Fall did not occur as a result of food poisoning, but was a spiritual change that happened as a result of Adam and Eve's rebellion. A third spiritual being lived in Eden, namely the serpent, who is widely seen as a symbol for the fallen angel known as Lucifer or Satan. Despite God's instructions to Adam and Eve as to how they can live forever in the Garden, they allow themselves to be seduced by this serpent and to eat of the forbidden fruit. As a result, "the eyes of both of them were opened" and they realize that they are naked. They feel ashamed of themselves and cover their sexual areas with fig leaves. Feeling conscience-stricken, they also begin to fear Yahweh's anger. When confronted by Yahweh, they blame each other. Confronted with this disruption of the original harmony of Eden, Yahweh makes garments for Adam and Eve, but condemns them to live outside of the Garden of Eden. This expulsion should not be thought of as divine punishment, but rather as the inevitable consequence of their disunity and strife. Indeed, if the Garden of Eden symbolizes humanity's original harmony, then as soon as Adam and Eve began to feel shame, guilt and fear, they were already in fact existing outside of the Garden. To prevent the couple from eating of the Tree of Life and living forever, he drives them out of the Garden and places two cherubim and a flaming sword at its entrance, "flashing back and forth to guard the way to the Tree of Life." We find these two cherubim adorning the Ark of the Covenant on either side of God's throne, the "mercy seat" (Exodus 25:18-20); and in Isaiah the two creatures, called seraphim, purify the prophet of guilt before he can stand before God. (Isaiah 6:2-7) They represent the judgment that all fallen people must pass through before they can enter God's presence and be admitted to the Garden Eden. Like dawn spreading across the mountains a large and mighty army comes. Before them fire devours, behind them a flame blazes. The New Testament does not mention Eden by name. However, Jesus is referred to as a new "Adam," (1 Cor. 15:44), and the Book of Revelation quotes Jesus as promising: "To him who overcomes, I will give the right to eat from the Tree of Life, which is in the paradise of God." (Revelation 2:7) Revelation identifies this paradise as a highly civilized place—the New Jerusalem—rather than a primordial garden. It is described as the "Holy City… coming down out of heaven from God," in which the Tree of Life is situated, and the "River of the Water of Life, as clear as crystal," flows from the throne of God. Mythologists such as Joseph Campbell note that in early Mesopotamian creation myths there is also a Garden and a Tree of Life, but apparently no forbidden tree of knowledge. In this view, the Yahwist's Garden of Eden story was designed to denigrate Canaanite traditions in which the "mother of all living" (Eve in the Bible) was not a woman, but a goddess, Asherah, who shared her life-giving fruit freely; and the serpent was not an agent of sin but of healing and spiritual power. The theme of the Tree of Life and humanity's failure to eat from it and thus gain eternal life is found in various Babylonian legends. In the Amarna tablets, Adapa, the first man, is the son of Ea, god of wisdom, who has endowed Adapa with wisdom, but not with everlasting life. Ea gives his son instructions as to how to behave before Anu, the god of Heaven: "Bread of death will they offer thee; eat not of it. Water of death will they bring thee; drink not of it." Adapa does as he is told, but the bread and water Anu causes to be placed before him are of life, not death. Thus Adapa loses his chance of eternal life. In the Epic of Gilgamesh Utnapishtim—a human who has been granted eternal life by the gods—tells Gilgamesh of a plant that restores one's youth, but when Gilgamesh retrieves it, the plant is stolen by a serpent. Genesis describes both the Tigris and Euphrates as originating in the Garden of Eden. Yet this information is less precise than it first appears. The identity of Pishon and Gihon have been the subject of endless argument. The first century C.E. Jewish historian Josephus and several early Church Fathers believed the Pishon to be one of the rivers of India, while Cush is Ethiopia and thus the Gihon is the Nile. There is no place on the globe where these four rivers meet. Yedi Göller (Seven Lakes), in the Taurus Mountains, Turkey. If the Garden of Eden had really been near the sources of the Tigris and the Euphrates, then the geographic location would be generally in the region of the Taurus Mountains of Anatolia (in today's Turkey). More widespread is the view that Eden was located somewhere near the Persian Gulf. 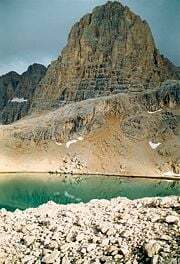 This location was proposed by John Calvin and other biblical exegetes, who believed that the Shatt al-Arab—formed by the union of the Tigris and Euphrates near the Persian Gulf—was the river that "went out of the Garden." Some historians dealing with ancient Sumer, where the earliest surviving non-biblical sources of the Eden legend may lie, point to the Bronze Age commercial center of the island Dilmun (now Bahrain) in the Persian Gulf, described as "the place where the sun rises" and "the Land of the Living." After its decline, beginning about 1500 B.C.E., Dilmun developed such a reputation as a long-lost garden of exotic perfections that some theorists believe it influenced the story of the Garden of Eden. 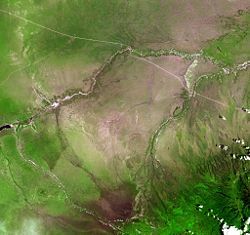 The Olduvai Gorge area, seen from space, is posited as a possible place of human origin. A location in Africa is another frequent choice. Many speculations as to an African location stem from the scientific evidence that human life is believed to have originated there. Yet Africa is also suggested in some classical texts. A passage in the Talmud points to the interior of Africa as a possible location of Eden (Tamid 32b); however other passages point elsewhere. Alexander the Great is supposed to have found the entrance of the Garden in African regions which are inhabited and governed exclusively by women. In addition, locations as diverse as Java, Sri Lanka, the Seychelles, and Sundaland in the South China Sea have been proposed. One recent claim by archaeologist David Rohl puts the Garden of Eden in northwestern Iran, in a river valley east of Sahand Mountain, near Tabriz. There have been attempts to tie the location of Eden with the mystical sunken land of Atlantis. In these theories, the current Tigris and Euphrates rivers are not be the ones referred to in the narrative, but are later rivers named after two of the earlier rivers, just as in more modern times colonists named features of their new land after similar features in their homeland. In Latter-day Saint (Mormon) theology, the Garden of Eden is believed to have been located at what is now inside the city limits of Independence, Missouri. Latter Day Saints believe the configuration of the continents was different before the Great Flood and that the geographical descriptions of Eden in Genesis refer to lands and rivers that were later renamed after the Flood. 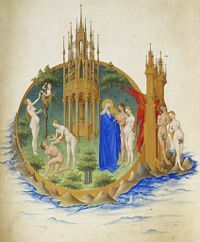 The Urantia Book (1955), a channeled revelation assumed to come from angelic beings, places the Garden of Eden in a long narrow peninsula projecting westward from the eastern shores of the Mediterranean Sea which was long ago submerged in connection with volcanic activity. The dominant view in Islam is that the Garden never had a terrestrial existence, but was instead an adjunct to heaven as it became identified with Paradise. Thus, Adam and Eve originally dwelt in heaven, and only came to dwell on earth after their fall. As mentioned above, for theologians who take the story allegorically, Eden as a psycho-spiritual state of primordial oneness with God rather than any physical location. Biblical literalists argue that even though Eden may not exist today, it did once exist just as the Bible says it did; but that since the world of Eden's time was destroyed during Noah's Flood, it is impossible to identify Eden's physical location today. The word "paradise," often used as a synonym for the Garden of Eden, is originally a Persian word describing a walled orchard garden or an enclosed hunting park. In the post-Exilic apocalyptic literature and in the Talmud, "Paradise" became associated with the Garden of Eden and its heavenly prototype. Jesus reportedly told one of the thieves who died with him on the cross that: "Today you will be with me in Paradise." (Luke 23:43) Saint Paul spoke of Paradise as the "third heaven," a heavenly realm of which he personally had a spiritual experience (2 Corinthians 12:2-3). In Talmudic literature and in the Kabbalah, the rabbis agree that there are two gardens of Eden: one, the terrestrial, of abundant fertility and luxuriant vegetation; the other, celestial, the habitation of righteous, immortal souls. These two are known as the "lower" and "higher" Gan Eden. The promise of the Garden of Eden as a primordial paradise, whether earthly or ethereal, has inspired people throughout history. Many groups have sought the restoration of Eden, some appealing directly to the biblical vision, while others have conceived of a restored Eden as an ideal world transcendent of religion's moral constraints. Early Christians looked forward to the "New Jerusalem," a heavenly city in which the Tree of Life gives forth 12 types of abundant fruit and the curse pronounced by God in Eden is forever removed (Revelation 22). The medieval Jewish mystical tradition, the Kabbalah, saw the Edenic Tree of Life as symbolic of the restored archetypal human being, called Adam Kadmon. Various millennialist movements have hoped for a more literal restoration of the Garden of Eden, often conceived as a kind of Heaven on Earth in which humans will no longer have to die. Still others, viewing death of the physical body as a natural shedding of a vessel no longer needed by the living spirit, look to a restored Garden of Eden on earth as a world of peace in which all people will have each realized the Christ consciousness lost in the original Eden. ↑ Infancy Gospel of James. newadvent.org. Retrieved July 28, 2007. Daniel Pouzzner. Returning to Eden (from a political, historical, and philosophical perspective). www.mega.nu. Dora Jane Hamblin. Has the Garden of Eden been located at last?. www.ldolphin.org. Review of the Young Earth Creationist Book "After Eden". answersincreation.org. History of "Garden of Eden"
This page was last modified on 23 May 2017, at 14:58.